20 minutes from Auckland, 500 meters from our main highway is a winery. When sitting down at one of their outside tables to enjoy a platter of mainly local delicatessen, you can’t help but gaze over the vines into the distance. It’s incredible. You feel as if you’re hundreds of miles away from anywhere. It’s easy to find emptiness and uninterrupted views in New Zealand. With a population density of around 16 people per 1000 square km, compared to about 400 in the Netherlands, and 260 in the UK, it’s no wonder that there are lots of open spaces and views with nothing but nature in sight. It’s not the wide views you get in flat countryside like in the Australian outback. NZ is also sometimes referred to as the Vertical country, as it’s pretty hilly. What makes those views so spectacular though is the large skies often with some white clouds dotted in. It really feels NZ is at the end of the world and the skies above those hills just keep going and going. They’re Endless skies. 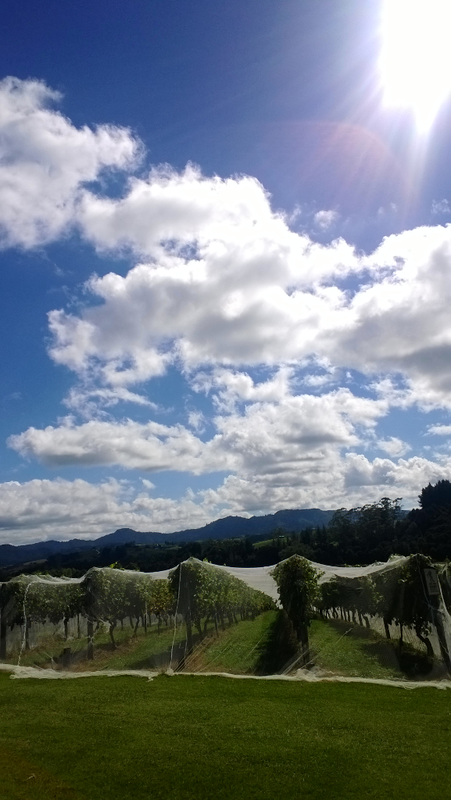 This entry was posted in A to Z challenge and tagged a to z, countryside, endless skies, new zealand, ransom winery. Bookmark the permalink. I have a soft spot for wineries – we were married at one :). I love sitting at the outside tables and looking out over the vines. That seems to be pretty universal no matter where you live :). Yes, agree. Wineries anywhere are great. Never thought I’d live so close to them though, its fantastic! Thanks for the comment!